Two technologies are of particular interest, in that they show the impact cloud computing is having on the data management discipline. Hadoop distributions are deemed to be obsolete before reaching the Plateau of Productivity because the complexity and questionable usefulness of the entire Hadoop stack are causing many organizations to reconsider its role in their information infrastructure. Instead, organizations are looking at increasingly competitive and convenient cloud-based options with on-demand pricing and fit-for-purpose data processing options. ESP is one of the key enablers of digital business, algorithmic business, and intelligent business operations. ESP technology, including distributed stream computing platforms (DSCPs) and event processing platforms (EPPs), is maturing rapidly. 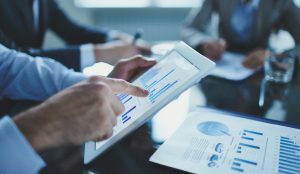 Stream analytics provided by ESP software improves the quality of decision-making by presenting information that could otherwise be overlooked. Public distributed ledgers, including blockchain, continue to have high visibility, although organizations remain cautious about the future of public (permission-less) distributed ledger concepts due to scalability, risk, and governance issues. Most business use cases have yet to be proven and extreme price volatility in bitcoin persists. Presupposing the technical and business challenges of distributed ledgers can be overcome; in the short term, organizations are most likely to use distributed ledger for operational efficiency gains via the use of shared information and infrastructure. Longer term, Gartner expects a complete reformation of whole industries and commercial activity as the programmable economy develops and ledgers contribute to the monetization of new ecosystems. The requirements for more standards and enterprise-scale capabilities are evolving slowly, but distributed ledgers are still not adoptable in a mission-critical at-scale context. Their value propositions, compared with existing technology, are also not clearly established, making the widespread acceptance of the technology problematic. Privately distributed ledger concepts are gaining traction because they hold the promise to transform industry operating models and overcome some of the issues of scalability, risk management and governance that plague public ledgers. As with blockchain, however, many business use cases are unproven at this time. Gartner clients can learn more in the report “Hype Cycle for Data Management 2017.” This research is part of the Gartner Trend Insight Report”2017 Hype Cycles Highlight Enterprise and Ecosystem Digital Disruptions.” With over 1,800 profiles of technologies, services and disciplines spanning over 100 Hype Cycles focused on a diversity of regions, industries and roles, this Trend Insight Report is designed to help CIOs and IT leaders respond to the opportunities and threats affecting their businesses, take the lead in technology-enabled business innovations and help their organizations define an effective digital business strategy. Information on further 2017 Hype Cycles covering data and analytics can be found on the Gartner Blog Network. 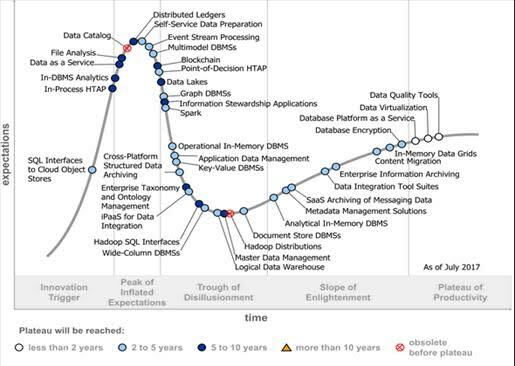 *Previously titled “Hype Cycle for Information Infrastructure, 2016, “Hype Cycle for Data Management, 2017” covers the broad aspects and technologies that describe, organize, integrate, share and govern data.